The history of Heidleburg Inc. D.B.A. Clarke’s Hardware & Bradley’s Hardware began on April 15, 1950 with the purchase of the first store, Village Hardware. 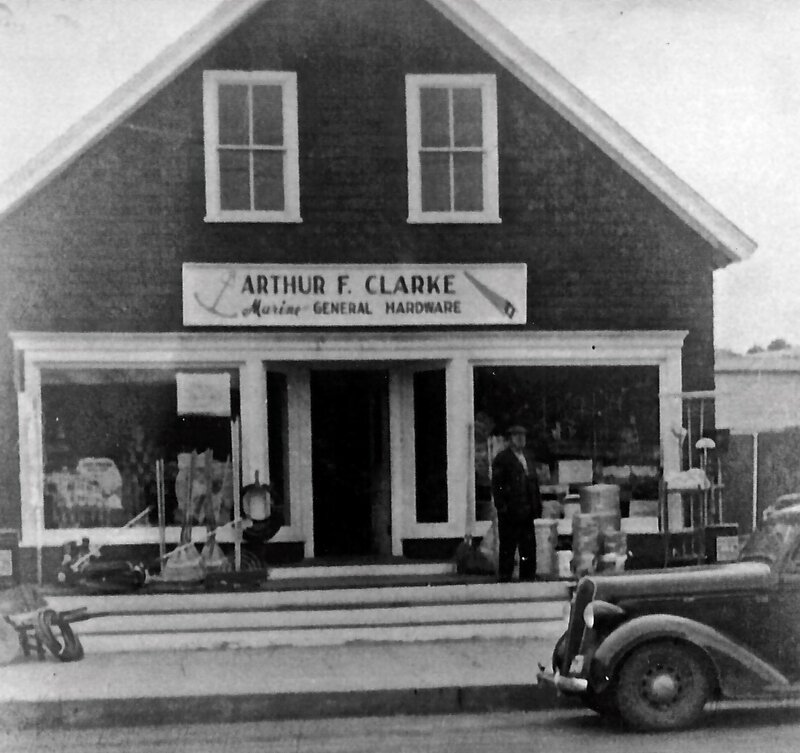 This 1,000 square foot store, renamed A. F. Clarke Marine & General Hardware, housed one part-time employee. Arthur F. Clarke was the sole proprietor. In 1960, the store was expanded to 2,500 square feet of retail space and 750 square feet of storage area. The store joined its first co-op in 1968, then named American Hardware Supply. The store was held by Arthur F. Clarke until February 1972 when it was sold. A second location was purchased in September of the same year in New London, New Hampshire. This 5,000 square foot store, named Clarke’s American Hardware, housed four full-time employees. In 1977, the store was expanded to 7,500 square feet of retail space. American Hardware changed its marketing name to Servistar and requested all dealers to do the same. The expanded store became Clarke’s Servistar Home Center. On September 1, 1979, a third store, Clarke’s Servistar Hardware, was opened in Claremont, New Hampshire. This 6,000 square foot store housed four full-time employees. Gordon L. Hunt joined the company in October of the same year. The Claremont store was closed in 1980 due to a lack of retail dollars to support the business. In 1982, F. Read Clarke joins the company. In July 1983, Heidleburg Inc. was established and purchased all assets of Clarke’s Servistar Home Center from Arthur F. Clarke. The fourth store was purchased shortly thereafter with a location in Wolfeboro, New Hampshire. This two-building site, named Bradley’s Hardware, consisted of 4,500 square feet of retail space and housed six full-time employees. Gordon Hunt relocated to Wolfeboro to run the store. In 1985, a renovation of the New London store was conducted using Servistar’s retail design. The name was changed to Clarke’s Hardware. In 1986, another expansion took place of 2,500 square feet outside storage for garden and landscape supplies. In the same year, the Wolfeboro store was expanded to 5,000 square feet under one roof. The second building at the Wolfeboro location was sold. In 1988, a fifth store, Kris Kringle’s Gift Shop, was purchased in New London, New Hampshire. The 1,500 square foot Christmas and gift item store was run by Arthur Clarke. The store was closed in 1990 due to a lack of retail dollars to support the business. Arthur Clarke retired from the company. 1992 brought the twenty year anniversary of Clarke’s Hardware, the New London store. In 1993, the Wolfeboro store expanded into the rental business, and leased 3,000 square feet renovated for retail display and on-site warehouse. The name was changed to Bradley’s Hardware & Rent Center. Marketing logos were developed in 1995 for the business. The New London store acquired a Lighthouse symbol, the Wolfeboro store a Golden Wood Screw symbol. In 1997, the New London store joined Hardware Wholesalers Inc. (HWI) as a second co-op supplier and the Wolfeboro store joined Ace as a second co-op supplier and renovated the retail sales area. In the same year, the business developed and implemented re-engineering procedures for management. In 1998, the New London store expanded its offering to the marketplace by adding a full scale do-it yourself Rental Dept. In 1999, Clarke’s Hardware reached an agreement with Ace Hardware Corporation of Oak Brook, IL to join their buying cooperative and maintain their marketing image in the New London store. This required Clarke’s to leave Servistar and HWI as suppliers and devote most of their buying direction towards Ace. In 2000, Clarke’s completed a Full Level Ace Vision-21 store make-over to conform to the national appearance of the Ace profile. This task was completed by April 1st to preview Clarke’s Hardware 50 years in business anniversary year long celebration. In 2003, Clarke’s Hardware signed the Ace Hardware commitment pledge of Helpful Service as a national campaign to excellence in the retail hardware industry. The store also received local recognition for “Best Service in Retailing” by an independent newspaper reader’s poll. In 2004, Clarke’s was recognized by Ace Hardware as a national leader in Retail hardware excellence. In 2005, Gorax Corporation of Wolfeboro, NH acquired Bradley’s Hardware. Clarke’s Hardware starts the study and implementation of the E-Myth best business management practices and procedures for small businesses. From 2005 to the present the store has expanded staff, product offerings (such as our depth of earth-friendly items) and business styles. The year 2010 marked our 60 year Anniversary! In 2013, Clarke’s Hardware expanded into the adjoining space in our shopping center. This allowed us to improve our Paint and Housewares merchandise and reposition the entire store to 11,000 square feet of display area. We move forward to continue providing what you need, and help in how to do it. Our quality products and solid customer service are what we are all about!